Modular carpet offers a modern and stylish alternative to broadloom, or roll, carpet. Also called carpet tiles or carpet squares, modular carpet consists of smaller pieces of carpet with an integrated backing and base that attaches directly to your flooring substrate. 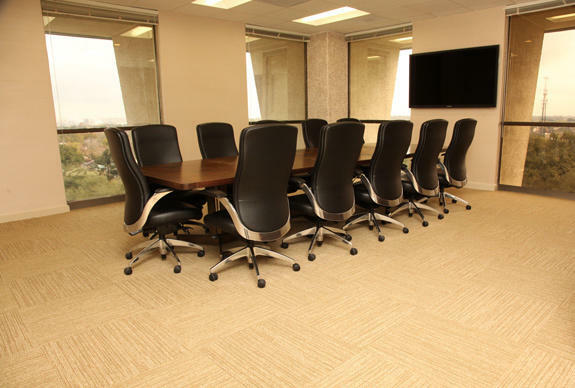 Many commercial buildings utilize modular carpet due to the versatility and functionality it provides to office spaces. Don't forget about style—the range of shapes and sizes available for modular carpet makes it extremely adaptable, able to fit into any design scheme. Ready to get started on your carpet project? Whether your style is modern or more traditional, we can help you select the modular carpet flooring that suits your space.